Forward Brandon Dickson had a breakout season for the Vikings varsity soccer team, thanks to his camp experience in Europe this summer. HASLETT, Mich.- Haslett high freshman Brandon Dickson is rarely nervous. He didn’t get scared when he traveled overseas last summer to take on some of the top soccer academy teams in Portugal and Spain. And he didn’t have any nerves when he took the field this season as the youngest player on Haslett High School’s varsity team. “I’m always ready to play,” Dickson, 15, said. It was mid-June 2018 when Dickson and his parents embarked on a two-week camp across the Atlantic Ocean in two of the most prominent soccer countries in the world. Dickson, a forward, is part of the elite U14 NASA program. No, not the agency sending astronauts to space - but rather, the North American Soccer Academy (NASA). The organization is an exclusive club for the highest-ranked soccer players on the continent. The org annually takes trips to Europe and compete against some of the finest academy teams those countries have to offer. Dickson and his team spent most of the days on the pitch. They played two games each day while mixing in some training sessions. They also spent a couple of hours in between to explore the cities. He also experienced soccer culture on the other side of the world, during the 2018 World Cup tournament. It was the perfect time to be in Europe. “It was really interesting because instead of basketball hoops all over the place they have mini soccer fields all around,” he said. The best part was a visit to Camp Nou, the stadium of FC Barcelona, and Santiago Bernabeu Stadium, the home of Real Madrid FC. Those memories will stay with Dickson for the rest of his life. He gained valuable experience in playing games. Going up against teams like the Spanish U14 National Team gave him a different look at how other cultures play soccer. A few months later, Dickson began high school and used those newfound skills and strategies to his advantage. Dickson said that summer trip prepared him for his first season of high school soccer. Dickson didn’t expect to get the call-up to the varsity team right away, but his coach saw something special. He finished the year with three goals and four assists. They are not gaudy statistics, but what he did on the field, even if he wasn’t scoring, made him an asset for the Vikings. “Sometimes I felt like I couldn’t take him off the field,” said Salazar. 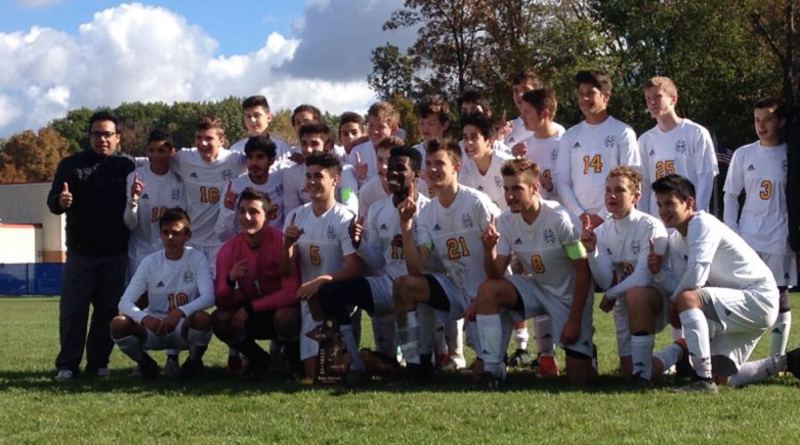 Dickson was instrumental in helping to lead the Vikings to the regional finals, the farthest Haslett has ever made it in the state playoffs, before falling to Grand Rapids Forest Hills Northern High School. It was a strong building-block for what could be a breakout sophomore year for Dickson if he stays at the school. Salazar jokes that he is afraid he may lose Dickson to a high-level academy team. But that could be a real possibility. Dickson has the skill to compete at that level, or even beyond it. At just 15, Dickson has proven to be one of the best young talents in the area.